France’s Eventing riders produced an emphatic win in the first FEI Nations Cup™ Eventing competition of the 2015 season at the weekend in Fontainebleau (FRA). The French team repeated their 2014 victory when they also won on home soil, and they enjoyed a comfortable winning margin of nearly 30 penalties over Australia, who finished second. Gwendolen Fer (FRA), riding Romantic Love, was best of the team in individual second place and she had an excellent Cross Country round for just 1.2 time penalties, which was easily the fastest time of the day. Arnaud Boiteau, riding Quoriano ‘ENE HN’, was fourth and newcomer Helen Vattier on Quito de Baliere was ninth. An all-male Australian trio opted for steadier Cross Country speeds in their first international competition of the year. Christopher Burton was the fastest, clocking 8.8 time penalties on TS Jamaimo, to finish fifth. Last year, Burton had to withdraw the horse before Cross Country due to colic at the Alltech FEI World Equestrian Games™ 2014, so he will no doubt be delighted with TS Jamaimo’s sparkling performance to start the season. Great Britain, who maintain a policy of fielding younger, up-and-coming riders who have yet to ride on a championship team, also fielded three riders and finished just 0.3 penalties behind Australia. Izzy Taylor, a regular on FEI Nations Cup™ Eventing teams, was the highest placed in sixth on the mare KBIS Briarlands Matilda. Four teams contested this first of eight competitions in the FEI Nations Cup™ Eventing and the Netherlands finished fourth, having dropped from third place after Dressage due to Cross Country time penalties. One remarkable result from the weekend was that all 14 team members jumped clear across country, although none of them achieved the optimum time of 6 minutes 19 seconds around Fontainebleau’s twisting forest tracks. Fer and Burton were also penalty free in the Jumping stadium. Germany, winners of two out of the last three series, could not field a team at Fontainebleau, but their leading rider Michael Jung still led from the start to collect individual honours on his wonderful horse La Biosthetique Sam. No doubt the Germans will be out, all guns blazing, before long. The FEI Nations Cup™ Eventing next crosses the Irish Sea, to the Fell family’s hospitable event at Ballindenisk in County Cork (IRL) next month, which last year produced a win for the British team. 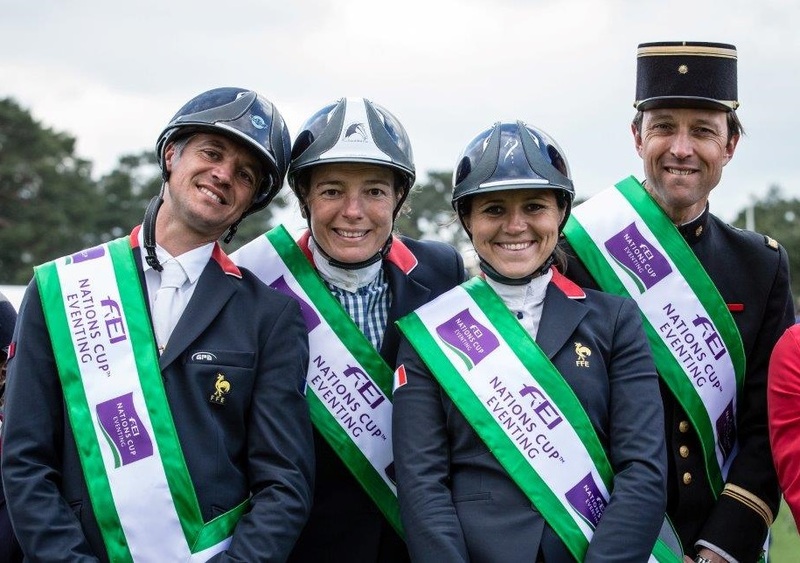 The French team repeated their feat of 2014 when they also won on home soil, and enjoyed a comfortable victory at the opening leg of FEI Nations Cup™ Eventing 2015 in Fontainebleau. Left to right: Karim Florent Laghouag (FRA), Helene Vattier (FRA), Gwendolen Fer (FRA) and Arnaud Boiteau (FRA).